Banana powder is made from processed Bananas. It has been traditionally used as a baby food. We make it from organic bananas without adding any colours, flavor or preservatives. It can be given to babies for gaining weight and enhancing their immunity power. It is rich in minerals and dietary fiber. Additional Information: Authentic products from the original abode of Ayurveda. Vedagiri Herbals brings to you premium products in the beauty care, personal care and food product categories, based on traditional, time-tested Ayurveda recipes. The brand brings you the essence of nature without any man-made additives.All their products are sourced from organic raw materials and prepared using sustainable methods and are free from parabens, triclosans, mineral oils, silicones, SLS/SLES, DEA/TEA, artificial fragrances or colours. 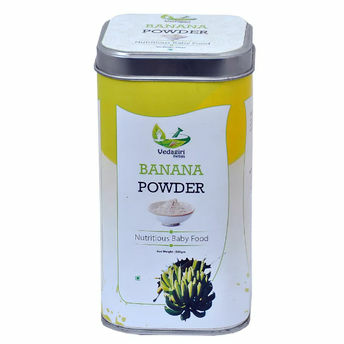 Alternatively, you can also find many more products from the Vedagiri Banana Powder range.